Overnight closures of the Nene Parkway will be required to fix a bridge which was hit by a lorry this morning (Wednesday). The collision happened at 8.50am at junction two, the Orton Malborne turnoff. 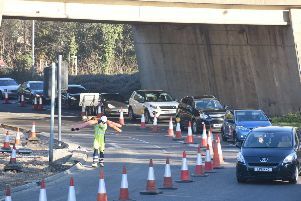 There has been a partial closure of the Nene Parkway and the roundabout linking Orton Malborne and Morley Way in place all morning while engineers inspected the bridge to make sure it was safe. While it was deemed safe to open at about 1.30pm, a Peterborough City Council said they expected overnight closures would be needed to carry out some repairs. It is not yet known when the closures will be in place for the repairs.